In A Snap! 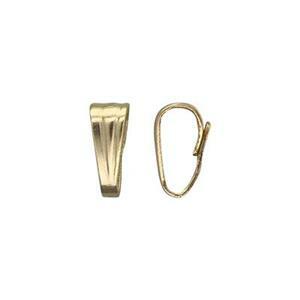 That’s how fast you’ll have your necklace piece finished – with our GF849 – 14/20 Yellow Gold-Filled Small Snap Bail! Just press the bail against the ring of your charm or pendant – and then slip your Gold-Filled Footage Chain creation through the Snap Bail Loop – and voila – you’re done! I like to use these on fine little chains with small pendants. I have also used them with leather cord and soldered them closed. I like them. But had to solder shut to hold my pendant or it would have opened. These snap bails do not stay on a fine chain well. It is difficult to get it to stay together unless you glue the bail shut. It is pretty and lightweight though. ******************Halstead Customer Service response Hi Vicki. Thank you for your feedback. It is indeed very lightweight and best suited for dainty pieces. We appreciate your comments. You are welcome to return any items you do not find satisfactory within 30 days of purchase. Thanks for taking a moment to write a review!